Before I begin describing the wildlife I saw, I have to mention that I am not a wildlife person. I enjoy watching the occasional bird or animal during my hikes and trips, but I never seek it out or look for it. I never plan a trip around it, and this trip was no different when it began. During the course of the trip, things did change. When we entered Yellowstone around dusk the first day, we saw a few cars stop along the road-side and some people peering out into the meadows through their binoculars. Looking at the meadow, we saw a couple of deer-like animals far inside, but we couldn't see much beyond their generic shape. Disappointed, I insisted that we buy binoculars so we could see animals better. My husband agreed, and the first thing we did the next day was buy binoculars. They proved to be immensely useful. On our second day, we saw a couple of elks right next to Canyon Village. Grazing in a small meadow, they put on quite a show for all the tourists. And wow, they were gorgeous to say the least. Although they were not too far, I decided to check them out via the binoculars. It was mesmerizing to look at their features. Their olive colored velvet skin and symmetric antlers make them one of the most beautiful deer-species. The way the carry their antlers is so graceful and elegant. I lost my vocabulary looking at them and described them to my husband as "magentic" instead of majestic. I spent close to an hour staring at them. They're taller and bulkier than a normal deer, and they're alert and aware of everything happening around them. Even if we moved a step, the elk would notice it. 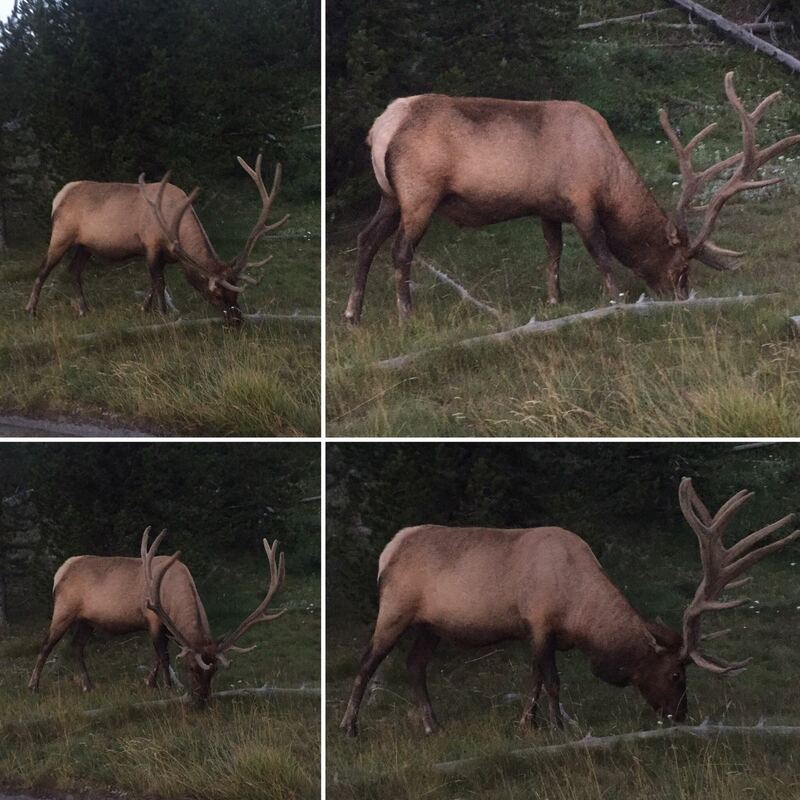 During the course of my trip, I saw elks 4-5 times, and every single time the size of their antlers stunned me. You think you'll get used to it, but you never do. Coyotes are quite common in California, so it wasn't the first time I was seeing a coyote - but it was the first time I was seeing one so close-by. We went to Artists Paintpot during dusk on our third day and saw a coyote roaming aroung in the parking lot. It seemed hungry and did not run away on seeing us, which was a surprise. It wandered around for a while searching for food, and left after finding nothing. It came and left in less than five minutes, but that was enough for us to get some great views of it. It looked very much like a dog, but seemed more agile and nimble. Pretty good-looking too, I'd say. I'll state the obvious first - we were lucky to spot a wolf, not once but twice during the course of our trip. Wolves are notoriously hard to find, and disappear in a matter of seconds after being spot because they're so fast. The first time we saw a wolf was near Gibbon Meadows, right after we spotted the earlier mentioned coyote. After seeing some cars parked there and some folks looking around with their spotting scopes, we stopped to look as well. After what seemed like a long time (but was only 15 minutes), a lone black wolf stepped out from a thicket of trees into the meadow. It ran to the center of the meadow, howled, and in a matter of minutes disappeared into the other end of the meadow. It seemed like it was in a hunt, but it didn't catch anything. The moment passed by in a blur, but I remember its muscular body moving ahead in giant leaps and dust raising from the ground with every leap it took. Spectacular! It's a beautiful sight to watch wildlife in it's natural habitat. The second time we spotted a wolf was during dusk at Hayden Valley. There were many spotters looking around with their scopes, and we heard that a wolf pack resides in that area. The wait was much longer this time, and a pair of wolves (black and grey) stepped out after 8.30 pm. Once again, they announced their arrival with howls which all of us heard. The meadow in Hayden Valley was much further away, and it was close to darkness, so we couldn't see either wolf with our binoculars. Luckily, a couple from Utah offered us views of the black wolf from their scope, and we happily took a look. The black wolf was trotting along the meadow when I looked, and it was muscular and strong, like a giant dog. If you're going to Yellowstone, you will see a bison. 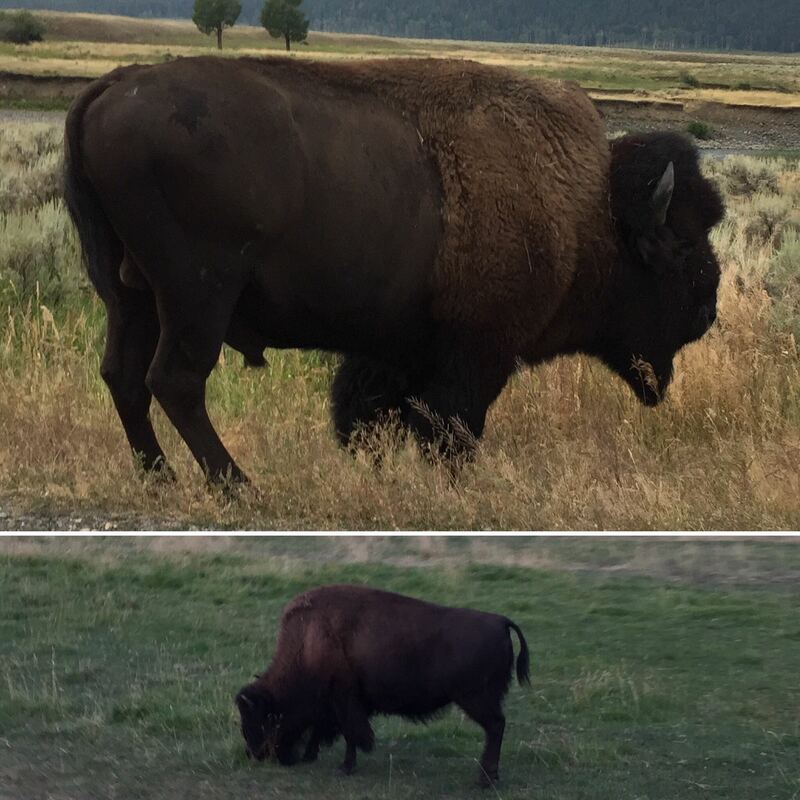 Seeing a bison in Yellowstone is like seeing a sheep in Iceland, you can't not see one. We saw herds and herds of bison all over Lamar Valley and Hayden Valley, especially during dawn or dusk time. Most of the times they were demurely eating grass (again, like the sheep in Iceland, sometimes balancing themselves on a rock ledge atop a hill). Occasionally, the males were grunting and running around the females, as it was the mating season when we went. The young bison calves stuck with their parents, but also surprised us when they sometimes ran almost as fast as a deer. We realized these animals can sprint if they need to. Full grown males are wide, muscular and huge, and can push a car aside with their strength. When they are grunting and running, it's best to give them their space. Bison jams are common in Yellowstone, when a bison steps on to the road and everyone slows down to get a good glimpse of it from up close. We avoided getting too close to them, as recommended. Now we're getting into unfamilar territory. As we were exiting Lamar Valley around 9 am, we saw bighorn sheep next to the road. There were two adults and two calves. Bighorn sheep are usually spotted high up on the mountains, because that's where they live. I think the group we spotted were moving from one mountain to another, so we lucked out. Bighorn sheep were eating grass along the road-side, and seemed to not care much of the traffic obstruction that they caused. They didn't have any wool, and their grayish skin looked similar in texture to a deer than a sheep. Their backs and the back of their legs had a distinct white lining in sharp contrast to their gray skin. Like deer, they were very alert and conscious of their surroundings. The clicking sound of a camera made them look up. After a couple of minutes, they went their way into the woods. Read about more animals in Part 2, including my encounter with the grizzly bear. Read about some more animals in Part 3, along with tips for wildlife viewing! 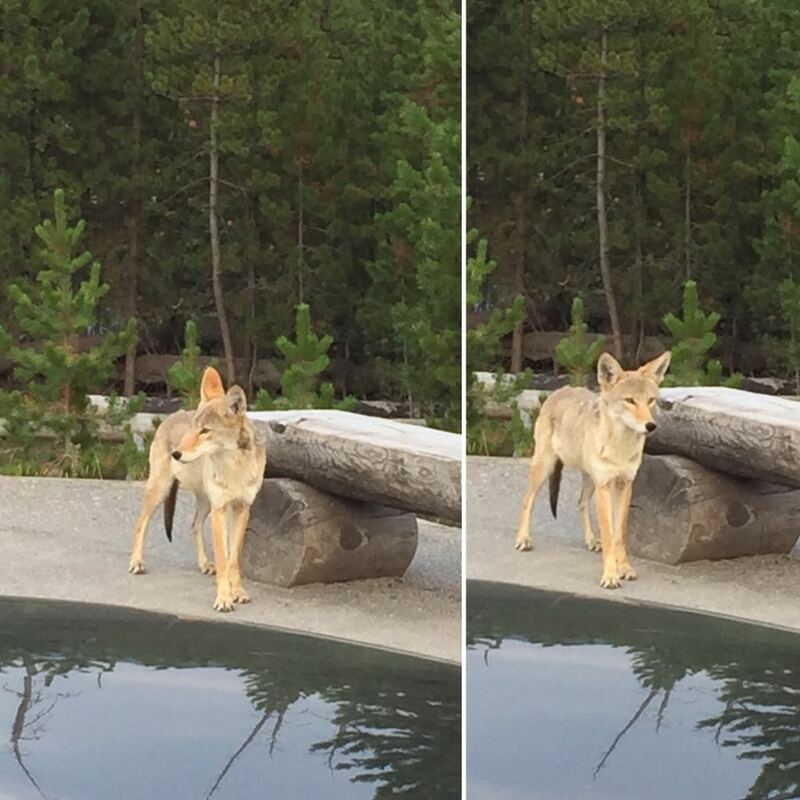 What animals did you see in Yellowstone or elsewhere? How did the encounter make you feel?